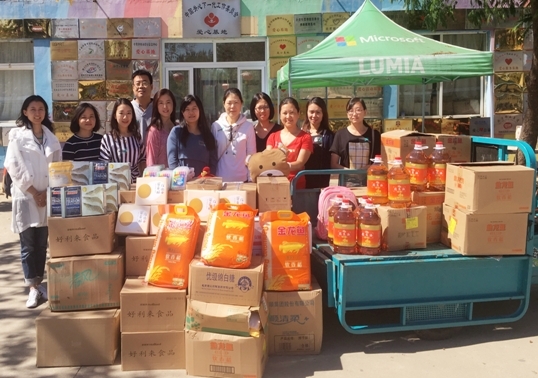 On Sept. 21, a group of employees from Syniverse’s Beijing and Xi’an offices made a return visit to Sunvillage orphanage in Beijing to donate goods and spend time with the children there. The visit followed a first visit we made last October. This time, our visit was for the occasion of the Mid-Autumn Festival, one of the biggest holidays in China and a time when families come together to celebrate with special meals and traditions. Last year, after researching several charities in our area, our Employee Association selected Sunvillage because we were impressed with its unique mission of giving a home to children whose parents are in prison, and with its distinguished reputation throughout China. The children of convicts can have a difficult time finding a home, guardian, or way of providing for themselves, and they can often be drawn to a life of crime to be able to survive. Sunvillage takes in these disadvantaged children and provides them a home, food, education and parental guidance up to the age of 18. The orphanage currently cares for about 60 children from ages 6 to 16. Our team (with me third from left) and the goods we donated to Sunvillage. Eleven employees from both our Beijing and Xi’an offices took part. The visit was organized by our Employee Association, a group responsible for leading charitable and extracurricular activities in communities where Syniverse offices are located. Each year, many Syniverse Employee Associations around the world identify charitable organizations in their local areas, and then get the input of the office’s employees to select a few charities that the office would like to support. We visited the orphanage for a few hours, had lunch with the children, and gave them some special gifts and donations. This included bringing a lunch for all the children, which we prepared ourselves, along with moon cakes, a traditional food of the Mid-Autumn Festival that we gave to each child. We also brought each child a box of pens, and we donated a variety of foods, clothes, books, and toys to all the children at the orphanage. Many of the more than 200 employees at our Beijing and Xi’an offices pitched in to help us collect a large donation of goods. Just as with our first visit to Sunvillage last year, the most rewarding part of our latest visit was helping bring joy to and provide important emotional support for children who have had the misfortune of having a parent in prison. The Mid-Autumn Festival is one of the most important holidays of the year in China and a special time for family members to get together and celebrate. We knew these children would not have families to celebrate with, and we wanted to do what we could to make up for this by giving them a special afternoon. This second visit to Sunvillage is just one more way we’re trying to give back to our community in Greater China. Syniverse has been a part of this community for more than a decade and now has a team of more than 200 members across Beijing, Xi’an and Hong Kong. These team members came together to brighten the lives of some special children that we will never forget, and we look forward to more events like this where we can help those less fortunate. Kira Li is a Human Resources Business Partner at Syniverse's Beijing office.